Today was a bittersweet day. 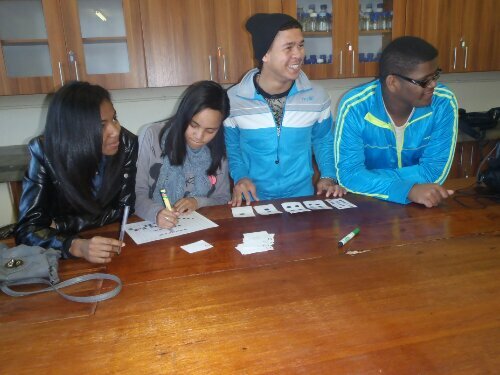 We are glad to ho back to the school and hang out with the teens. We have come so close to them in such a short amount of time, but we are sad knowing this is the last day we will spend with them. It may be the very last time we see our smart and beautiful friends. We had one last lesson in the morning. 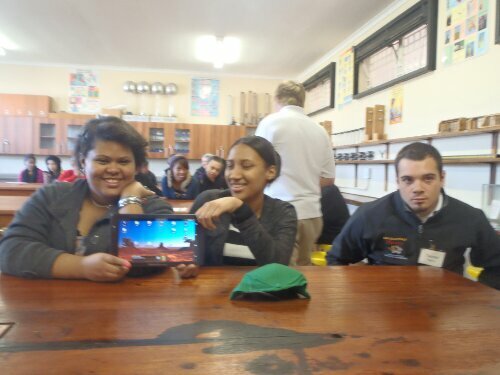 I taught them about the insides of a computer and the tools the computer can provide, especially the helpfulness of tablets and mobile devices. Most of the teens have Facebook, so I covered some internet safety and ethics. We then gave the school 5 tablets of different sizes which had some learning apps pre-loaded. They were so appreciative of the gift. 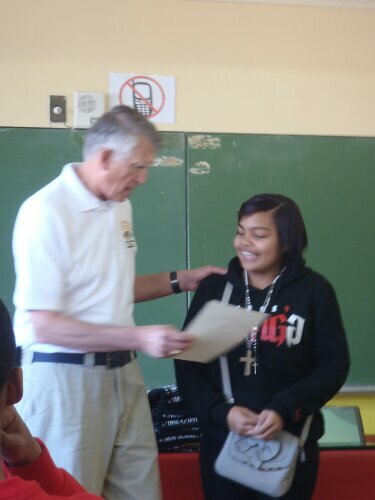 After lunch was had an award ceremony where we presented the learners with graduation certificates. They gifted us with mugs and plaques with their school crest: a great gift to remind us of our experience here. The next part was the hardest. The good byes. We took many pictures and exchanged hundreds of hugs and farewells. As we took off in the van, the students stood in front as a barricade not wanting us to leave. Our whole group was almost in tears. It was incredible how we developed such deep bonds in only a few days. It was extremely hard to see these students so intelligent and curious who had so much to offer our world who have so little when we have so much. We complain when we are a little cold or tired or hungry. These students just want to learn, and they are doing it with uncomfortable conditions, with hammy-down books, and broken desks. 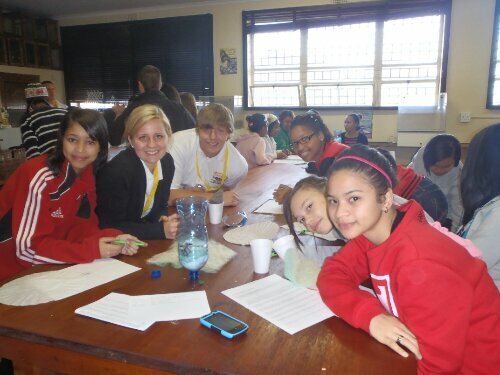 This experience has really reminded me not to take my blessings for granted, especially my education. With knowledge, many doors are opened to provide for yourself and others to have better life. It is so disheartening to see so many here that do not have the opportunity to educate themselves in order to escape the cycle of poverty. These students live a much different life than I. 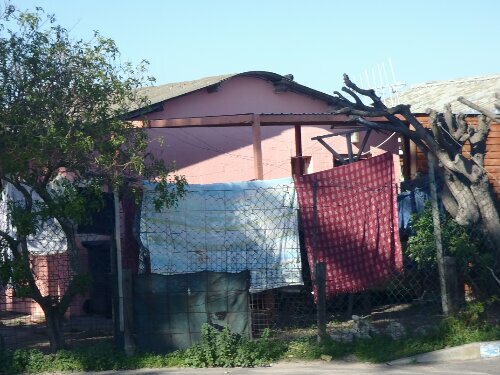 Their homes much smaller and less comfortable, their clothing and food less favorable or less available than I, their risk for gang violence, sexual assault, and disease are much higher than mine. In reality, we are very much a like, just like me, these girls want to dance, laugh, to be loved, and not to stress. I am so lucky to have had this opportunity to meet these students, to share in their smiles and to share my passion and talents with them. They have shared so much with me, and this is an experience I will never forget. Today was the day for my lesson at the school. I have been really excited to teach the plan Levi and I prepared when we were back in the states. 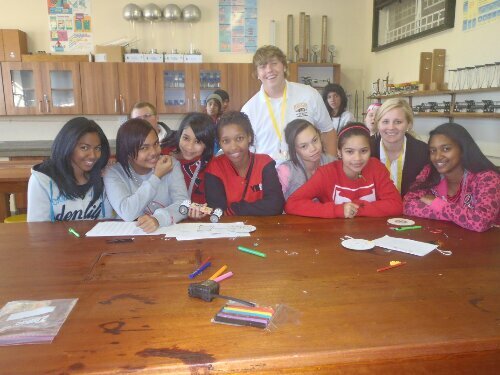 I was even more excited after having seen how the learners responded to the groups yesterday. 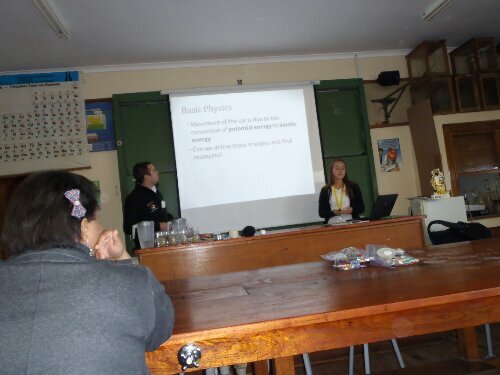 We began our presentation with some basic computer knowledge. 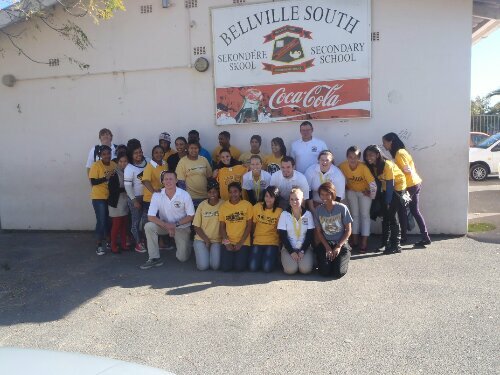 Belleville south had a handful of computers, and the learners had some basic experience with email, Facebook, and some other programs. We explained to them more about how computers communicate through the language of binary. This was new to them, and they had some great questions for us. 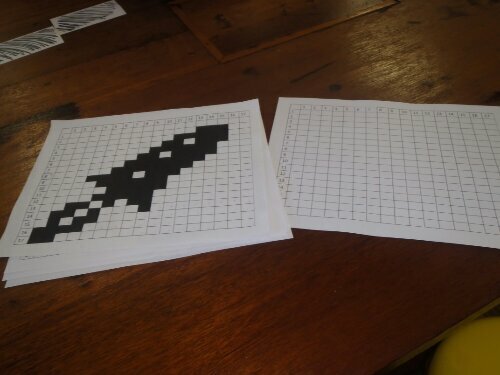 Then we began to explain the binary system to them, and how to read and write numbers in binary. I loved seeing the light bulbs click as they understood how it worked, and then see them eager to help their fellow classmates understand. Our activity required the groups to split in two. One acting as a computer in South Africa, and the other acting as the computer in the States. The first group had a picture colored in black on a grid. Their job was to send the pixels in binary to the other group, where the second group would decode it and color their empty grid accordingly. They were so quick to catch on, and worked so hard to win the competition. We even had time to do another. 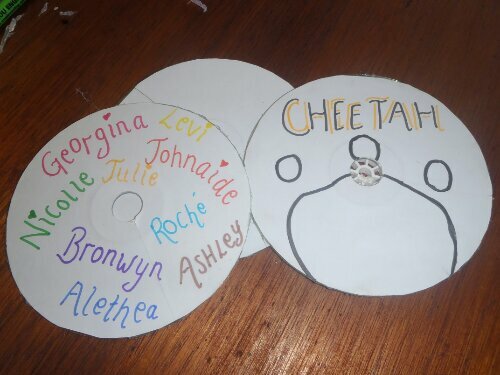 I was so proud of my cheetah girls for winning! One boy was so interested in the computers and binary he said he hoped to become a computer engineer. It is so cool to have these kids looking up to us, and to be able to provide them with the invaluable gift of knowledge. 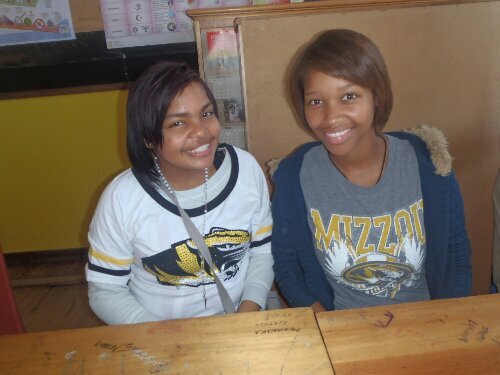 Our prizes were Mizzou t-shirts. 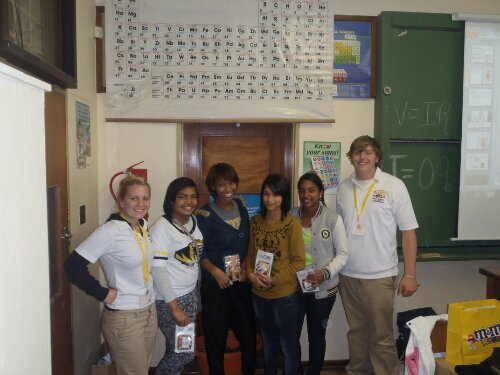 I want to especially thank those who gave me some Mizzou shirts from their own collection to share with these teens. I don’t even know how to explain how excited they were to have them. American culture is huge in South Africa. 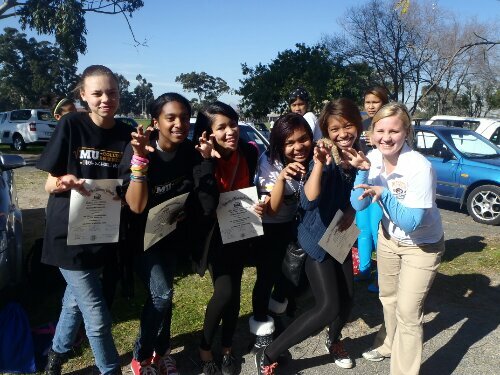 Many of the teens asked if there were scholarships to MU, because they wanted to be tigers. They raced for the opportunity to have a gold or black shirt to wear. Many of them put them on right away, and wore them the next day as well. Our last lesson was taught by Jenna and Ashton. They discussed the properties of resistors in electrical circuits. Their activity was using Ohm’s law (V=IR) to find for a specific current, and decide how much resistance was needed. Then they had to use the color code chart to find what the resistor was needed, and build the correct circuit. Once it was built they could measure it with a multi-meter. Levi and my team was very quick to solve this activity. They had some experience with ohm’s law before, and remembered how to use it. During our spare time, we went outside to warm up and get some fresh air. The school building is very cold and damp, it reminded me of a jail I toured once. I think the concrete structure with no insulation and broken windows creates the uncomfortable environment. Being outside was very nice in comparison. Thanks to my mom, I brought 10 frisbees to share with the group as prizes. We played with those outside. During our personal presentation, I told them that I was on the cheer and dance team in highschool. The girls asked me to show them a few things. This was so much fun, we cheered and danced together for a long time. I taught them some cheers from CJA, then they taught me some moves too! We have really bonded with one another, and the days are going much to fast at the school. I have learned more Afrikaans words–> computer=relcenaar and dance=danse. 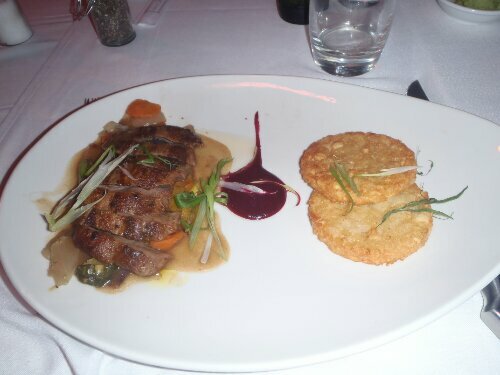 For dinner we went to a nice restaurant, and ordered springbok which is similar to a deer or antelope. It is the animal that their rugby team is named after. The meat was delicious! Keep posted for our last day at the school. I woke up today very excited. 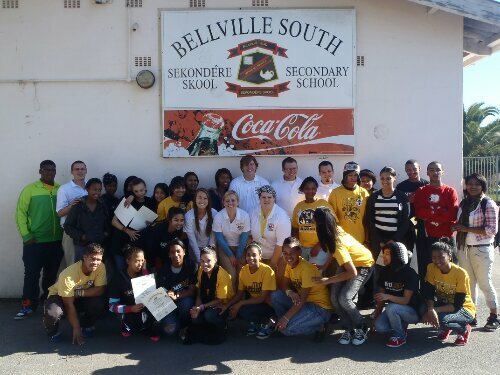 It was our first day to go to Belleville South High school. 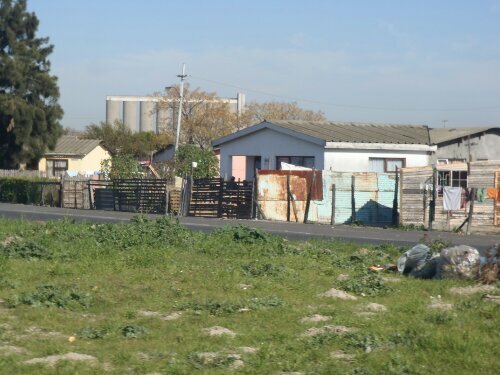 I really was anxious to see the school, and to see the teens living in theses shanty areas we saw along the highways. 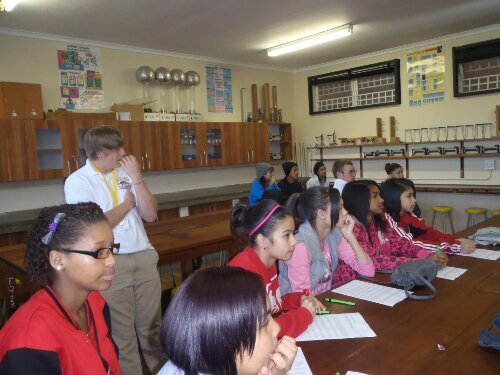 Our class was made up of about 30-40 students ranging about the ages 14-17. Levi and I are the leaders of a group made of all girls 15-16 years old. Just like in the US, these ladies LOVE to giggle. They found our accents so funny and drilled us about the music we listen to, and movies we liked. I think we asked them just as many questions. South African teens like a lot of the same music and TV shows as the teens in the US. 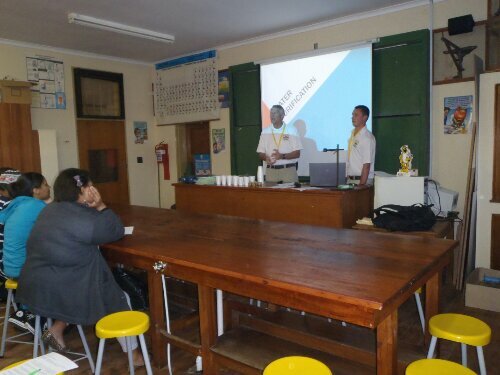 Today we had two presentations for the learners. The first was about water purification, the necessity for water, permeability, and potability. Marty and Mark were great with their lesson, and were a big hit with the kids. 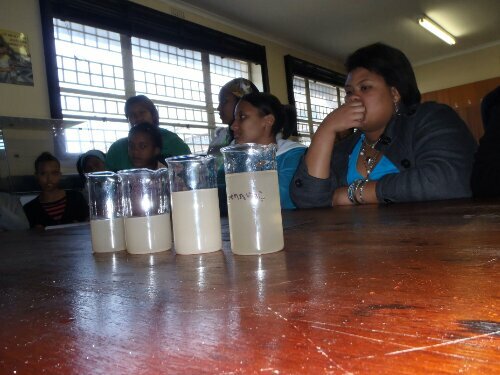 Once we covered these topics, we had an activity where the learners worked in the groups to design their own water filter. They used different types of materials such as sand, rocks, and fiber glass to filter some swampy water. Mark and Marty even drank the water after the filtration. It was still brown looking, but it was safe to drink! 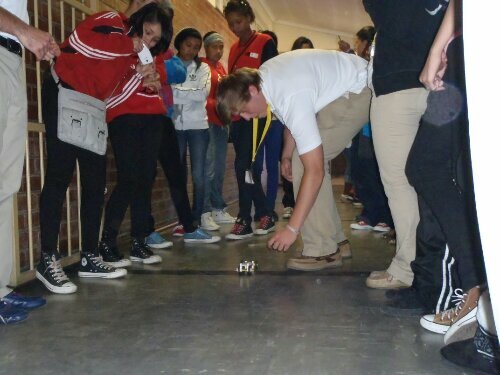 Our second lesson covered many physics principles and ended in an activity using these forces to build mouse trap car. 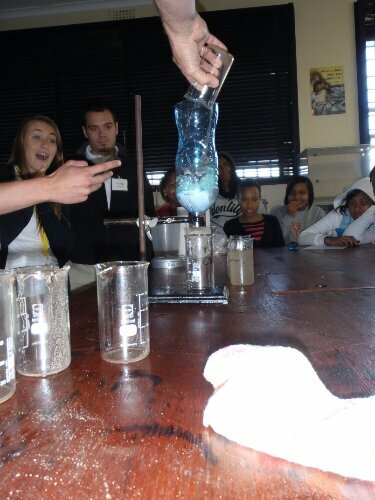 Gabby and Tanner did great with their lesson, I think the learners liked this activity the best. The girls told us they had just been studying physics. It was cool to see them getting excited about potential and kinetic energy, friction, and torque. I learned molweni means hello to a group of people and molo means hello to one person. One of the coolest things, is seeing the students eager to learn. It is currently towards the end of their 3 week winter break. The students are choosing to forgo their vacation this week to come to our engineering camp. Unlike many students in the states, they are so excited to be here and ready to learn. They are so beautiful inside and out! 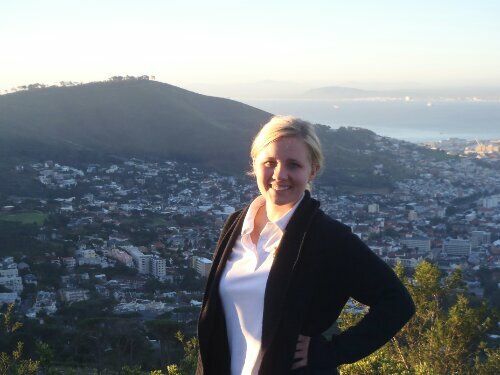 We then drove near Table Mountain and Signal Hill for some breath taking views and photo opportunities. 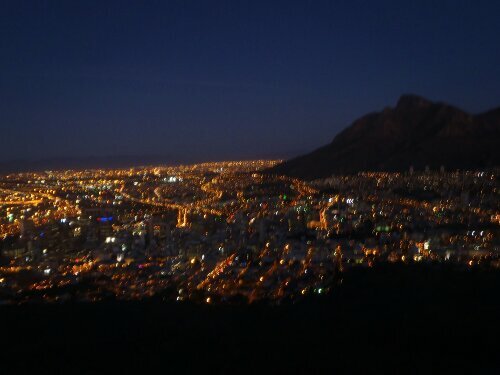 We plan to come back in a few days to go to the top of Table Mountain. I need my dad, the geology king, to give me a lesson on the type of rock, and explain how it formed, and how it became so flat on top, like a table(hence the name, Table Mountain). We headed to a local piano bar for dinner, and then went to Long Street to check out some bars and dancing. Monday morning started out with an early breakfast at the cafe near the condos. 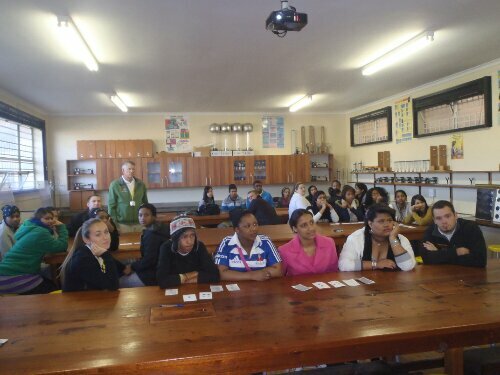 We then headed out to find Western Cape university. Like I had mentioned before, the GPS, and the driver (cough Marty cough), we got super lost. Most of us fell back asleep, but I think the drive took well over an hour. Once we finally arrived, we were greeted with a warm welcome from Jarard, our MU-WCU contact. He filled us in with information about the university which used to be for blacks only. After apartheid, much more money was given to the school for improvement, and it was opened to all races. The campus was very pretty, and a lot like a smaller Mizzou. 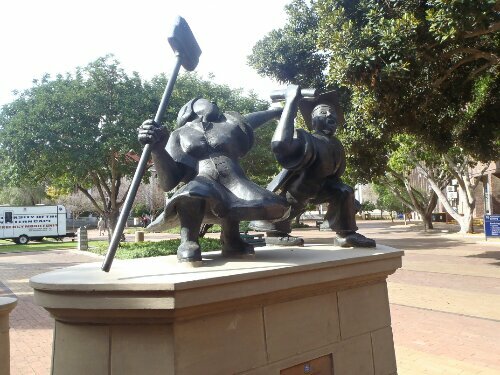 There was a cool statue in the quad area, it showed the transformation from a street sweeper, or manual worker, or an elated graduate. The ability for non-whites to get an education is still much harder than it should be. This is a transformation that is in the process, and we are here to help this cause. Tuition is about $1000 a year for students, which may seem cheap compared to US tuition, but it is very difficult for many here to afford any education. The current enrollment is about 7000. We then learned what exactly to expect in the school and the children we were to teach. The poverty ranges, but the means are much different than anything I have seen in the US. I will talk more on that later. On the way home we stopped at the airport to get tickets for later in the trip. We ended up as the target of a parking trip scam. Lucky Marty is a smart man, and called their bluff, regardless, we ended up stuck at the airport for at least an hour. We then headed to see the beach. 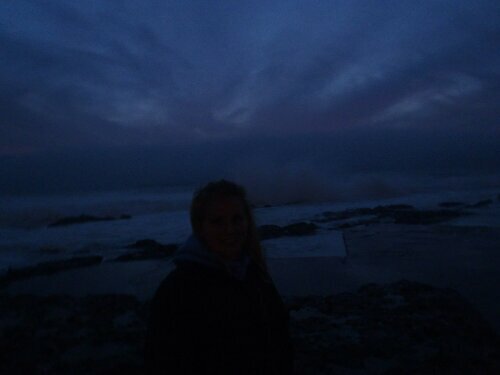 It was already pretty dark, and it being winter gave the beach an eerie feeling. The waves were incredibly massive. I have never ever seen waves so strong! 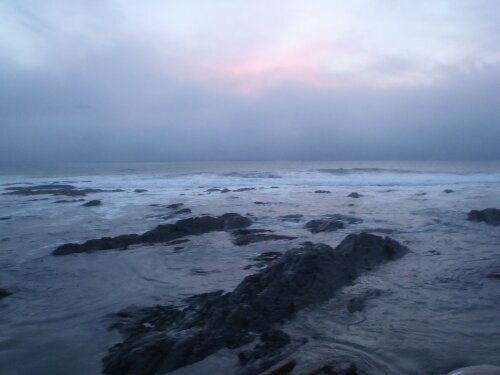 We watched the sun set while climbing around on the rocks. At some point almost everyone got their feet soaked in the frigid water( Jenna and I were lucky!). Dinner was at a Cuban restaurant, followed with a night of playing cards. 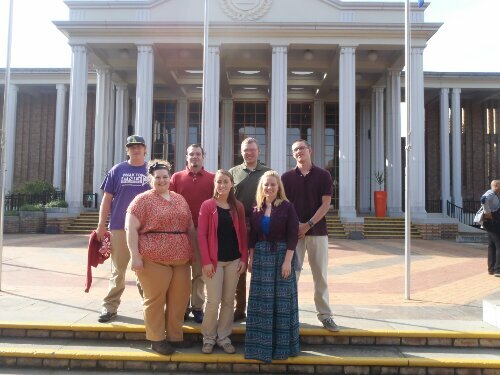 Sunday was our first full day here in South Africa. 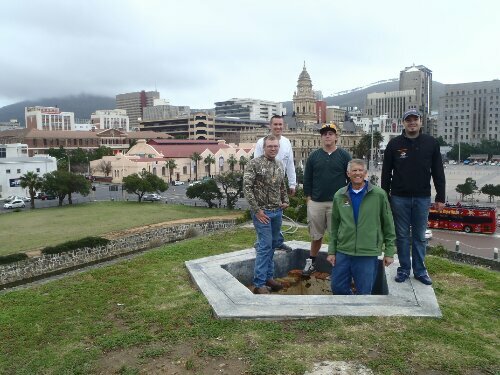 We mostly explored cape town, got our barrings, and located the ATMs. The money used here is called Rand, and the exchange is very favorable to us. $1 US dollar is equal to 10 rand. So at a dinner at a nice restaurant, the most expensive meal was 130rand for a delicious sea food platter. That was $13 US dollars! A great deal. 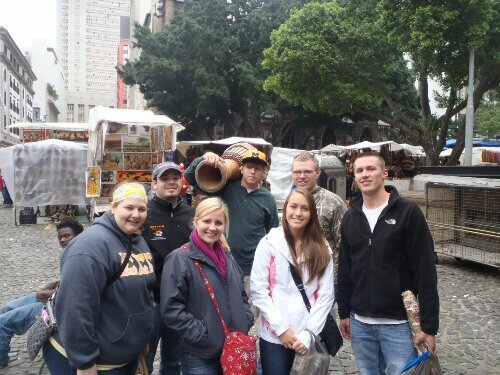 We stopped by the African market for a quick time, it was Sunday so it was a little smaller than usual, but such a colorful sight. 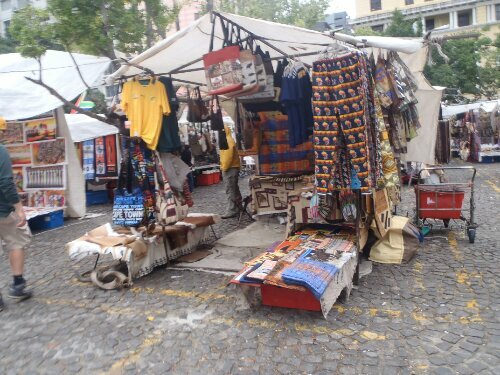 The square is covered in tents full of colorful goods, jewelry, bowls, masks, bags, and many other handmaid goods. The bartering is in full swing. The boys and Marty loved haggling for a good price, but I am rather shy to do so! 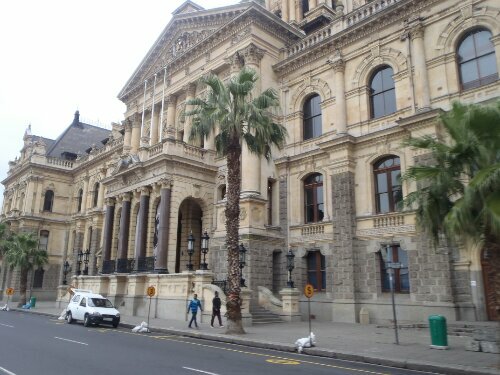 We then drove to see the court house where Mandela gave his first speech. We then toured the army fort next door. 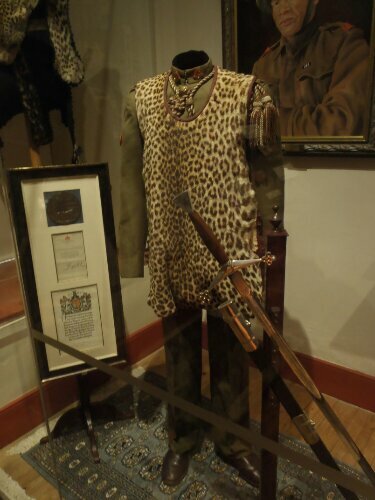 This fort had a museum of South African military, which was new to me. 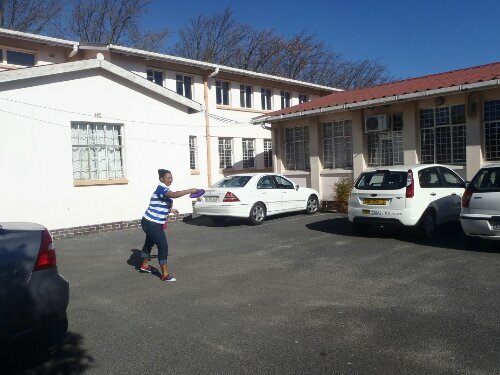 This was the first military base in South Africa. It had a great view! And some pretty crazy military uniforms…Shannon, if you ever joined the army, you would totally need one of these. The boys did some crazy climbing here too! Here they are in a pit. We attempted to head to a winery for dinner, but once again got lost. The GPS system does not work everywhere here, and has caused us quite a bit of frustration. We ended up at a restaurant with great wine and food anyways. The group had a good night at some local bars for drinks and music. Yay! We are on our way to the other side of the world! What a long day of travel it has been. The last few nights I have not gotten much sleep due to the holiday festivities, and traveling around the state. This morning I started off early to pack my final bag before mom dropped me off at the airport. 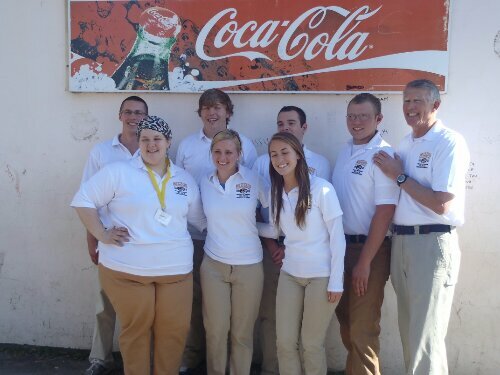 All 7 students plus Marty, our professor mentor, made it though security besides a small scissor incident. I guess our supplies looked a little suspicious in Gabby’s carry on. About 24 hours of travel has left plenty of time to catch up on my sleep plus watch a few movies. Don’t worry dad, I brushed up on my survival skills with Liam Nessian in Taken 2. And in case someone has a little too much wine at the winery, Hangover Part 2 should help us figure out what happened. Okay well above when I said 24 hours, I was on the plane estimating our time based on our tickets. Well I’m sorry to say, that was quite the under-estimation. I got to the st. Louis airport at about 10:30 am and we finally got to our condo in Capetown at 6:44pm the next day… That’s 32 hours of travel! We were on schedule from st. Louis to DC. From DC to Dakar was our long flight which was also right on track. Our Dakar to Johannesburg was a little behind, and by the time we got through customs and got our bags, we missed our next flight. We has to wait a couple hours for the next connection. Many people had the same issue with the flights so our baggage was all mixed up, and we were unable to find two bags. Ashton and Tanner wore that first set of clothes for way to long. Then we all loaded into our rental van. Marty driving this oversized stick shift van on the left side of the road was, and still is SCARY! We ended up getting lost for an hour…maybe two. 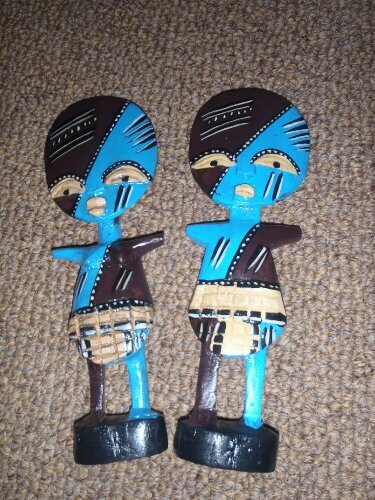 Apparently people in South Africa are not good with their lefts, rights, and directions in general. We kept getting sent in circles. When we finally reached our destination. It was something like 3am here and we were not quite ready for bed because our clocks were all out of whack. We went on a prowl for some quick food, KFC was the only thing open, but it are tasted good! We headed back to the condos for a few hours of sleep. Stay tuned to hear about our adventures now that we are settled. Packing. If feels like I have done nothing but packing and organizing this past week. I am about to take off on my journey to South Africa, immediately followed by a week on the lake with my family, which will be immediately followed by my permanent move to KC where I will begin work. Did I spread myself a little thin over the next month? Probably. Am I sorry? Not yet! I am so excited for adventure after adventure after adventure. This past week, I have been running around trying to prepare for everything coming up. 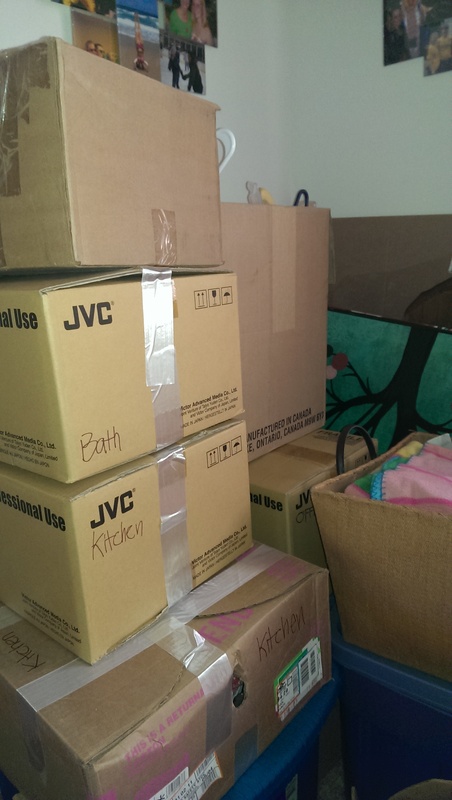 I think I am just about ready… as long as I don’t end up in South Africa with nothing but swim suits and coverups that are supposed to be packed for the lake. This past weekend George and I drove up to KC and met my parents for a full day of apartment hunting. Most people who know me would not be surprised that I prepared a packet of printed information about 5 different apartment complexes. The info for each included the pros, cons, distances to each of our places of work, prices etc. My intensive preparation packet paid off, because we were able to make a selection pretty harmlessly. So I now have a place to call home when I am done with all my travels. Having selected a place to live really has allowed me to envision what my life will look like in just a few weeks. The empty apartment we saw will soon be full of my things and be me home! 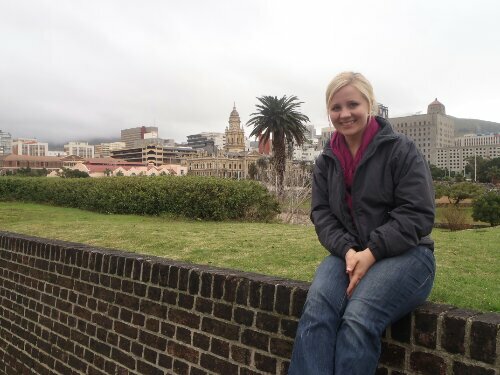 We will also be going to Robben Island where Nelson Mandela was jailed ( This will be my second trip to prison this summer –>check out my post about Alcatraz). If you follow the news, Mandela is in currently in very poor health. We have been monitoring his situation as no one can really predict what the country will be like in a mourning period for a great leader. My homework to you: Watch the movie Invictus, starring Morgan Freeman as Mandela. The movie is very inspiring, and great background to what I will be writing about the next two weeks. We will also see Table Mountain, tour Kusile Coal Fired Power Plant, visit Johannesburg, and safari in Kruger National Park. I am not sure how much internet access I will have over the next 17 days, but I plan to document the whole trip with lots of photos and my written accounts of our experience there. I hope you stay tuned.